Android has allowed users to block notifications from apps for almost as long as I can remember, but it was always an all-or-nothing approach before Oreo brought along the Notification Channels API that gives user more control over which notifications they want to receive and which ones they do not. While multiple apps seem to be adding support for the feature, not many are announcing it through a changelog on their Google Play listings. Twitter is another high-profile apps that seems to have incorporated the feature under the radar. According to Android Police, even version 7.15.0 of the app, which was released last September, seems to have had the feature, but it has managed to fly under the radar all this while, which is a little surprising. WhatsApp was another high-profile app that recently added support for Notification Channels stealthily, so you have to wonder why the developers are not using the changelog to highlight some of the cool new features they are incorporating into their apps. 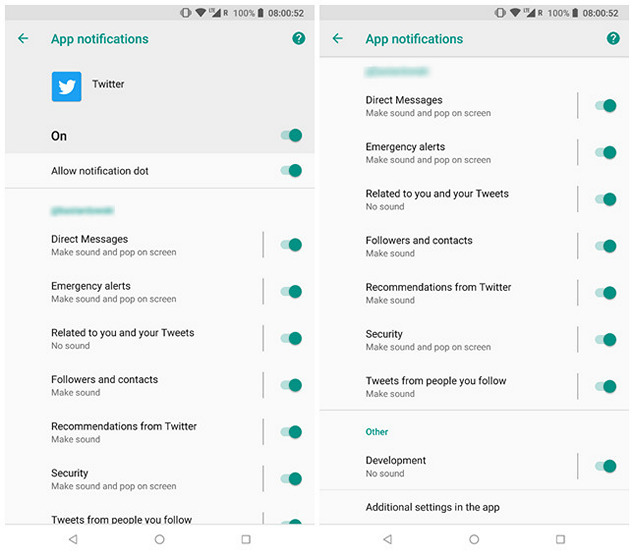 Either way, now that Twitter has added support for the new feature, let’s take a look at some of the categories you can choose to receive notifications for. As can be seen in the screenshot, direct messages, emergency alerts, related tweets, recommended tweets, etc are just some of the categories you can toggle on or off. People who are on the beta can also apparently choose to have the ‘Development’ option turned on.